Wolves kept alive their slim chances of reaching the Championship play-offs as they came from behind to draw with Ipswich. The hosts were deflated when Richard Stearman headed into his own goal. 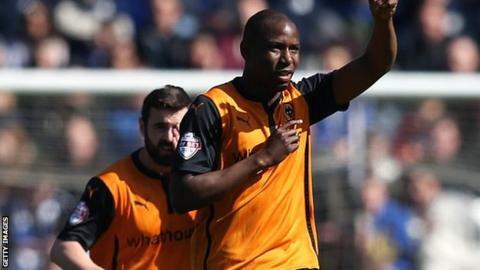 But after Nouha Dicko headed wide from four yards, Benik Afobe steered in his 31st of the season after Rajiv van La Parra's effort looped to him. Dicko came close to a winner but Wolves are three points behind sixth-placed Ipswich with two games left. With Derby and Brentford also in the running to claim one of two remaining play-off spots, and both teams drawing later on Saturday, there is still an uphill task for Kenny Jackett's Wolves side, who are chasing successive promotions. As the match finished at Molineux, there was a sense of a missed opportunity as Wolves wasted several chances to close the gap on their opponents. A point was more favourable for Ipswich, whose manager Mick McCarthy led Wolves to the Premier League in 2009. And with only one loss from their last seven games, he will hope he still has a chance of managing in the top flight again. McCarthy's team were under pressure early on as Wolves sensed the size of their task. Dicko, recalled to the team, and Afobe caused plenty of problems up front. Despite plenty of direct running and neat interchanges, they failed to trouble Bartosz Bialkowski in the Ipswich goal and paid for a lack of end product when they went behind to a calamitous own goal when Stearman nodded in Teddy Bishop's floated corner. The goal added to the home crowd's nervousness and it took time for Wolves to regain their composure. But they almost drew level when a mix-up in the Ipswich defence led to Dave Edwards striking the foot of the post from 14 yards. Dicko should have equalised after 46 minutes when he managed to head wide at the back post despite being completely unmarked. His embarrassment was short-lived, though, as Afobe tucked in from close range after Van La Parra's shot took a kind deflection off Tommy Smith. With 40 minutes left, there seemed to plenty of time for Wolves to find a winner, but they could not carve their way through a resolute Ipswich defence. Wolves now need others to slip up if they are to have any hope of reaching the Premier League. "It is out of our hands and now we will need to win our final two games and other teams will need to lose. But you don't know what will happen. "So we need to make sure that we go again next week. We will have to see how the table looks but one way or another we have to put in a good performance and give it everything we have got next week at Wigan. "If the door is still open through other people slipping up we have to make sure that we are there." "Wolves were in the ascendancy in the second half but we have had a great, stubborn, belligerent, professional performance - all those horrible words people don't like in football but I do because you win games and win leagues by doing that. "We are always hard to beat and hard to play against. The first thing I said to the players in the dressing room after the game was what a belligerent, stubborn, hard working, tough, horrible bunch you have turned out to be and I love you and I am proud of you because you need all those qualities to be a good team. It is lovely to have." Match ends, Wolverhampton Wanderers 1, Ipswich Town 1. Second Half ends, Wolverhampton Wanderers 1, Ipswich Town 1. Attempt missed. Paul Anderson (Ipswich Town) right footed shot from a difficult angle on the right is high and wide to the right. Assisted by Tyrone Mings with a cross. Attempt missed. Dave Edwards (Wolverhampton Wanderers) header from the centre of the box is close, but misses to the right. Assisted by Bakary Sako with a cross. Attempt missed. Kevin McDonald (Wolverhampton Wanderers) right footed shot from the centre of the box misses to the left. Hand ball by Dave Edwards (Wolverhampton Wanderers). Nouha Dicko (Wolverhampton Wanderers) is shown the yellow card for a bad foul. Foul by Tyrone Mings (Ipswich Town). Attempt missed. Chris Wood (Ipswich Town) right footed shot from the left side of the box is close, but misses to the right. Assisted by Cole Skuse following a fast break. Substitution, Ipswich Town. Chris Wood replaces Freddie Sears. Offside, Ipswich Town. Paul Anderson tries a through ball, but Freddie Sears is caught offside. Attempt blocked. Daryl Murphy (Ipswich Town) header from the centre of the box is blocked. Assisted by Paul Anderson with a cross. Corner, Wolverhampton Wanderers. Conceded by Christophe Berra. Attempt blocked. Nouha Dicko (Wolverhampton Wanderers) left footed shot from the centre of the box is blocked. Assisted by Benik Afobe with a through ball. Attempt missed. Stephen Hunt (Ipswich Town) left footed shot from outside the box is high and wide to the left. Assisted by Cole Skuse. Substitution, Ipswich Town. Stephen Hunt replaces Teddy Bishop. Attempt missed. Freddie Sears (Ipswich Town) left footed shot from outside the box misses to the right. Attempt blocked. James Henry (Wolverhampton Wanderers) right footed shot from outside the box is blocked. Corner, Wolverhampton Wanderers. Conceded by Bartosz Bialkowski. Substitution, Ipswich Town. Paul Anderson replaces Jonathan Parr. Substitution, Wolverhampton Wanderers. James Henry replaces Rajiv van La Parra. Delay in match Daryl Murphy (Ipswich Town) because of an injury. Offside, Wolverhampton Wanderers. Scott Golbourne tries a through ball, but Benik Afobe is caught offside. Corner, Wolverhampton Wanderers. Conceded by Jay Tabb. Attempt saved. Freddie Sears (Ipswich Town) right footed shot from outside the box is saved in the centre of the goal. Goal! Wolverhampton Wanderers 1, Ipswich Town 1. Benik Afobe (Wolverhampton Wanderers) right footed shot from very close range to the bottom right corner.